The Mobile Wireless is one of the most popular and powerful vehicle amplifiers available as it provides for up to 50dB of gain. It has the ability to provide a boosted cellular signal to all devices a small area or room and is capable of enhancing the signal for all North American 3G/EDGE networks (except iDEN, WiMax). It includes a low-profile interior antenna (301127) commonly referred to as “Hershey Bar” which easily mounts onto a dashboard or surface using a 3M adhesive and includes a 10-foot RG-174 coaxial cable. This amplifier is available in five varieties. The first (801201) includes the amplifier and interior antenna allowing for the choice of any vehicle, trucker, or marine exterior antenna. The other four are complete pre-built kits. One designed for vehicles (801212), one designed for trucks and RVs (801201-T), one which is designed for boats or other watercrafts (801201-B), and one which is a single-user solution (801212-K). The 801201 includes the Mobile Wireless amplifier, the Hershey Bar interior antenna, and a DC vehicle power supply. It requires the separate purchase of an exterior antenna and utilizes an FME-Male jack which easily connects to the majority of antennas available. The 801212 is a complete kit designed for vehicles which includes the Mobile Wireless amplifier, the Hershey Bar interior antenna, a 12-inch magnet mount exterior antenna (301103), and a DC vehicle power supply. The included exterior antenna easily mounts onto the top of a vehicle magnetically and includes a 10-foot RG-174 cable. The very strong rare-earth magnet is capable of withstanding the fast speeds of freeway driving. The 801201-T is a complete kit designed for trucks and RVs but can also work for vehicles and boats. It includes the Mobile Wireless amplifier, the Hershey Bar interior antenna, a heavy duty spring-mounted trucker exterior antenna (301133), a 3-way mirror mount for the exterior antenna (901104), and a DC vehicle power supply. The mount for the trucker exterior antenna is designed for truck side-view mirrors, rails, ladders, and similar surfaces so using this kit in a different type of setting (such as RV or boat) may require specific mount modifications. This antenna is heavy duty and capable of withstanding potential damage from driving through treacherous terrain. The antenna includes a 13.5-foot RG-58 coaxial cable. The 801201-B is a complete kit designed for boats and other watercrafts which includes the Mobile Wireless amplifier, the Hershey Bar interior antenna, DC vehicle power supply, and an AC wall power supply (859912), and the marine antenna kit (308430). The marine antenna kit includes a weatherproof marine exterior antenna (301130), a marine antenna mount (901119), and a 20-foot RG-58 coaxial cable (951125). The marine antenna mount attaches securely to a surface using four screws and includes a standard 1-inch x 14-thread mount with adjustable and clinching arms. The 801212-K includes the 801212 and the Cradle Plus interior antenna (301146) which is a handsfree cradle that enhances the cellular signal when a phone is placed onto the cradle (to be used with Bluetooth or on speakerphone). The Cradle Plus also includes multiple mounting solutions including a suction cup Gooseneck mount (901120) which attaches securely onto glass and a 7.5-foot RG-174 coaxial cable. There are many Add-Ons for the Mobile Wireless. 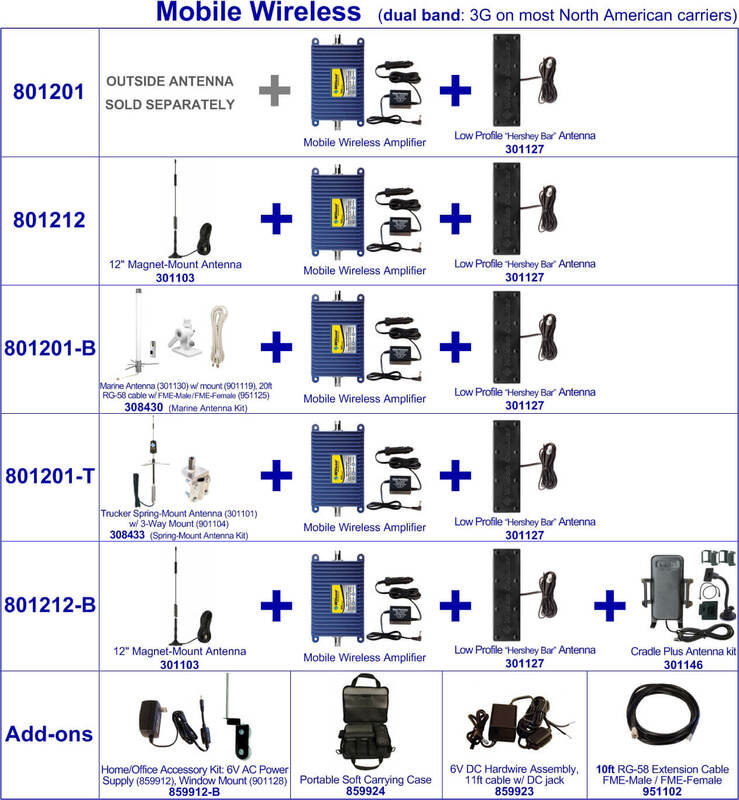 The most popular is the Mobile Wireless Home/Office Accessory Kit (859912-K) which includes a 6V AC power supply (859912) and an exterior antenna mounting bracket (901128). The mounting bracket for magnet mount antennas attaches to a window using suction cups and includes a long radial to minimize potential interference between the interior and exterior antennas. These components are all which are required for a Mobile Wireless amplifier kit to work in a desktop or small room setting. There is also a soft carrying case (859924) to transport the amplifier between different settings. To hardwire the power supply to a vehicle avoiding utilizing a cigarette lighter port, there is the 6V DC Hardwire Assembly (859923). This cable assembly features an 11-foot cable. And for larger vehicles or building settings, there is a 10-foot extension cable (951102).